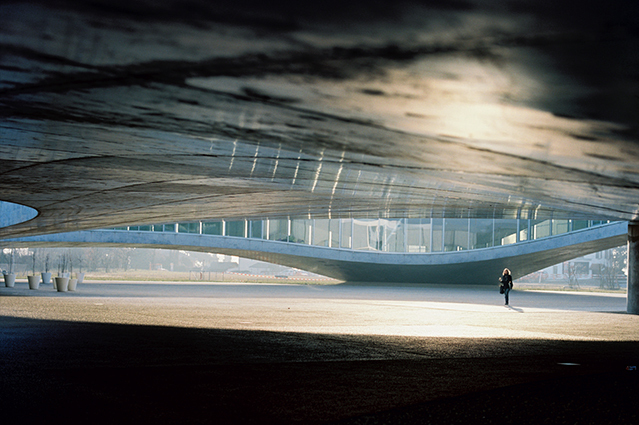 The Rolex Center is designed by the Japanese practice SANAA led by Kazuyo Sejima and Ryue Nishizawa. The building was inaugurated in May 2010 – in the same month where SANAA was given the Pritzker Prize for 2010. Located centrally on the EPFL campus and its new hub, the building is essentially one continuous structure spread over the site. The building is rectangular in plan, but appears to be more organic in shape because of the way that its roof and floor undulate gently, always in parallel. With few visible supports, the building touches the ground lightly, leaving an expanse of open space beneath, which draws people from all sides towards a central entrance. The most audacious aspect of the new library is its lack of physical boundaries. The large open space is defined by its artificial geography. It groups silent and calm zones along its hills and slopes, rather than offering traditional cloistered study rooms. As well as providing social areas and an impressive auditorium, the building lends itself to the establishment of quiet and silent zones, acoustically separated areas created through changes in height. The slopes, valleys and plateaus within the building, as well as the shapes made by the patios, all contribute to these barrier-free delineations of space. In addition, clusters of glazed or walled “bubbles” make small enclosures where small groups can meet or work together. Inside, the hills, valleys and plateaus formed by the undulation often make the edges of the building invisible, though there are no visual barriers between one area and the next.